VitaLink Professional Enriched Soil is scientifically proven to deliver fast, healthy plant growth and heavy yield. It contains 40% wood fibre, 40% peat and 20% bark fines with added beneficial microbes and nutrient. This mix creates an excellent physical structure to boost aeration and drainage. The added beneficial microbes increase nutrient uptake, improve plant establishment and prevent disease. The nutrient in this soil will feed your plants for up to four weeks. 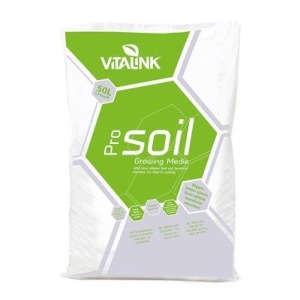 A reduced peat-mix, VitaLink Professional Enriched Soil is perfect for the eco-minded grower. The added beneficial microbes in VitaLink Professional Enriched Soil are scientifically proven to give you bigger, better plants. They improve plant establishment, prevent disease and boost nutrient uptake, which is key for the fastest, healthiest growth possible. The beneficial microbes also increase the effectiveness of mycorrhizal products, such as VitaLink BioPac. When using VitaLink Professional Enriched Soil, or when it is removed from the bag, you may see some fungal growth in the form of white Mycelia. VitaLink Professional Enriched Soil contains a high amount of beneficial fungi and this is a sign they have become active. Numerous scientific trials show that the VitaLink Professional Enriched Soil mix outperforms other soil brands in terms of plant health, growth and yield. The unique blend of wood fibre, bark fines, peat, beneficial microbes and nutrient that make up VitaLink Professional Enriched Soil is scientifically proven to deliver a bumper harvest. The wood fibre, bark fines and peat in VitaLink Professional Enriched Soil boost drainage and aeration to give you excellent plant growth and great control over your growing. All three ingredients have an excellent physical structure with an increased air-filled-porosity (AFP) and a reduced water-holding-capacity (WHC). VitaLink Professional Enriched Soil also has excellent re-wetting properties. I have had great success with this compost in my trials growing exhibition leek and onion plants.